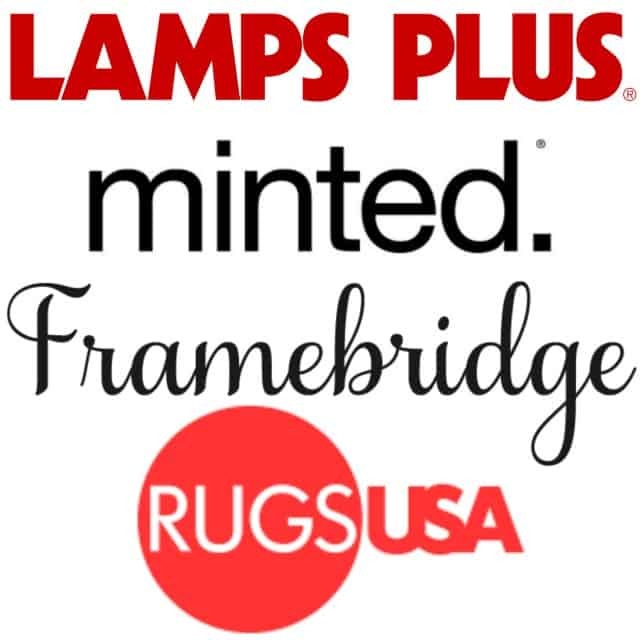 Disclosure: This is a sponsored post in conjunction with Minted, Lampsplus and Framebridge. I received wall art decorating accessories in exchange for this post. All thoughts and opinions are my own. Oh happy day! My Minted art came in the mail today and not a minute too soon. Just in time for week two of our New Year New Room Refresh: DIY Cord Covers. I was a little worried about my shipped items coming in time since shipping to Okinawa can take anywhere from 2 weeks to 2 months. I’m still waiting on an orders from two of our lovely sponsors, Lamps Plus and Framebridge. Keeping my fingers crossed. 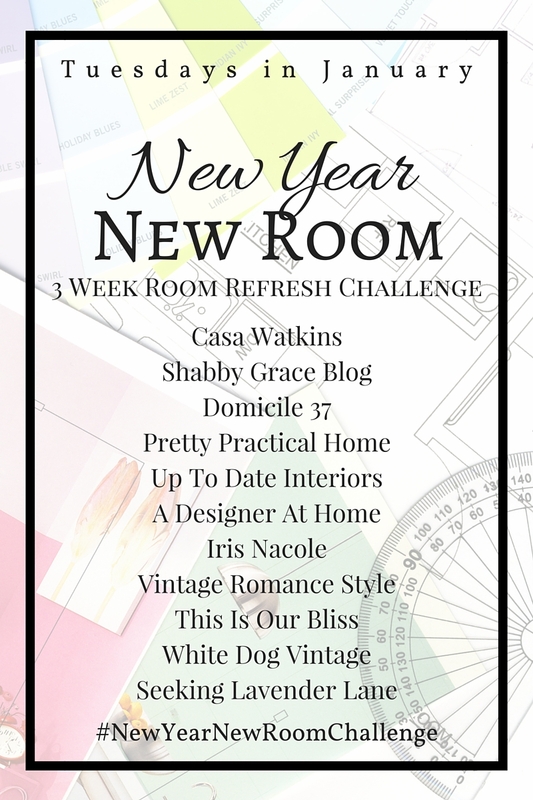 If you missed last week’s post, you can read about the plans and inspiration for our laundry/bathroom makeover and see it’s current state HERE. Okay, let’s get to it! 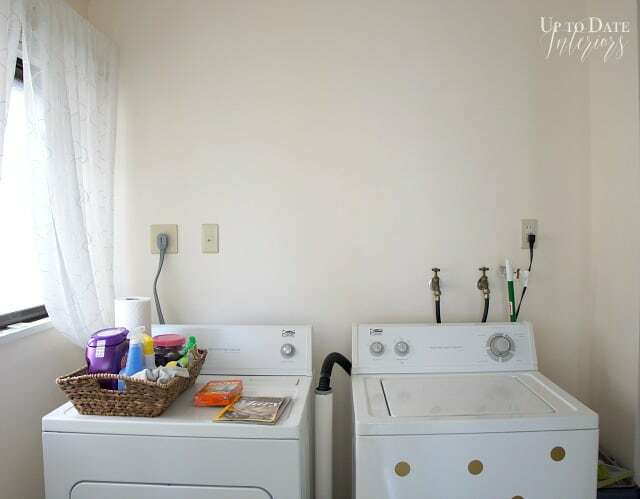 Do you remember the ugly cords and hoses that were exposed on the wall above the washer and dryer? Well, my plan for covering them actually went off without a hitch!! I found four baskets in a light color that were the perfect size to hide all of the wall uglies. Baskets large enough to cover cords, hoses, and outlets. The baskets can be wide but should be only 3-4 inches deep. I found two sizes priced at $4 and $6. Perfect. Simply attach one “L” bracket on each top side of the basket. Place a washer on the screw before threading it through the basket weave. Put the bracket on and use a nut to secure. To make this project renter friendly, attach command velcro strips securely over the exposed end of the brackets. Place on wall and press firmly. You can thread a hose or cord through the handle of the basket or cut a hole in the bottom. On the other side are the hoses which I couldn’t get them to budge an inch so I’ll to have to wait for my husband to get home to help me with them. A basket still covers them nicely in the meantime. I was so excited to hang gorgeous art from Minted.com. Command strips worked perfectly on the art too for a renter friendly solution. Here’s a sneak peek of two out three pieces I received from them. Purty, eh? In the meantime, check out the progress my friends are making with this challenge! They are such a talented bunch of ladies. Once again, a big thank you to our sponsors! « Love Your Space Series: Start with what you have! This is genius! Great Idea Kathy!! I adore the baskets and anyone could do this to kick start a gallery wall in the laundry room. Great Idea, I have this same problem in my laundry room but It would also be a great way to hide a router in the living room. Love this idea. Can’t wait to see more. That’s such a great idea Kathy!! I can’t wait to see the rest of the makeover next week! So simple and yet kind of mind-blowing! I NEVER would have thought of this, but it looks great. I really like how it fits in with your art AND you can use it for shelving. (!!!) Awesome idea! 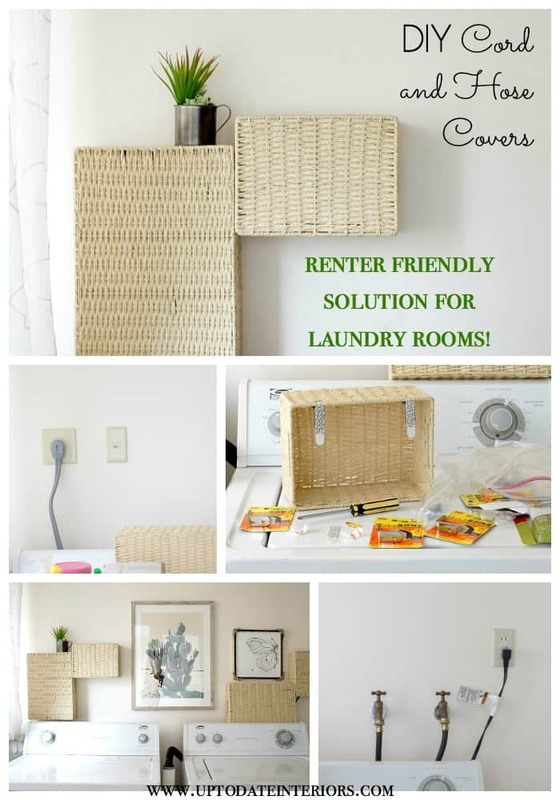 I never would have thought of using baskets to cover outlets and wires, genius! Thanks Katie! It’s funny how we come up with ideas. I just kept thinking I need a box to cover it but it needs to have an open bottom and back. Our tools are in long-term storage so I had to find a “box” that was premade. The only thing I could think of was a basket. This is SO smart. I would have NEVER thought to do that and it looks great! The art work is stunning! I hope all your goodies make it soon and aren’t Command strips the BEST?! You are so clever Kathy and you know how to fix all rental woes with inexpensive decor tricks that anyone can appreciate. This was a great idea. You always know how to make me smile! Thanks Jess. I always appreciate your comments. The basket idea is genius! I love that you can use them as shelves, too. The art from Minted is so pretty, and they are the fastest shippers, ever. The transformation is impressive already, so I can only imagine how beautiful it will be when everything arrives! Thanks so much Sharon. I was really impressed with Minted’s packaging and shipping, especially overseas!